We know you’re a keen sportsman and enjoy pushing your body to the limits. So, you’ll want to be sure to protect your joints from taking an unnecessary beating. 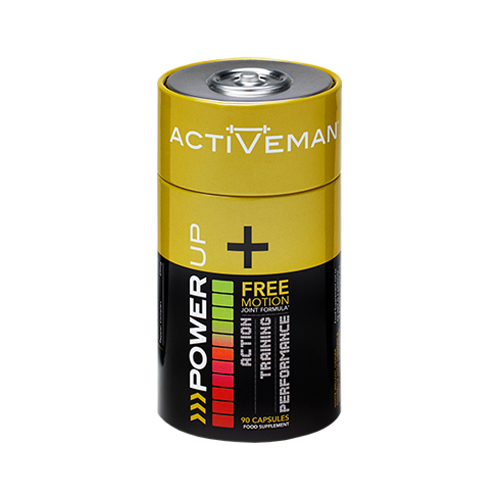 Activeman® FreeMotion’s potent joint support capsules combine the healing effects of vitamin C, boswellia extract, turmeric, marine collagen and white willow (salix alba) to help rebuild damaged tissue and promote overall joint health. This unique blend of ingredients is also known to increase mobility, flexibility and your range of motion. Activeman® FreeMotion delivers a cutting edge combination of nutrients to help you maintain the normal health and function of your joints. The comprehensive nourishment of seven ingredients in each capsule uses a multi-pronged approach to replenish joints, connective tissues and cartilage to help maintain your flexibility and mobility. Vitamin C, boswellia extract, turmeric, marine collagen, ginger root and white willow (salix alba) work together to create a fast acting approach for occasional ‘tweaks’ and joint stresses brought on by exercise, sport or physical activity. IS FREE MOTION RIGHT FOR YOU? If you train hard at the gym, on your bike or the treadmill, and your joints take a pounding, then yes, it is. The unique blend of ingredients in Free Motion, which includes Vitamin C, is an effective and convenient way to increase your mobility, flexibility and range of motion. It may also reduce minor exercise-related injuries. We’ve got you covered with a wide range of other performance products: Activeman® Energy Charge, Thermolean, Focus and Oatein, as well as Skinny Protein®, Whey Better®, Whey Hey® and vegan Lean&Green®. We’ve sourced the finest quality nutrients from the UK to achieve a premium quality content that is hard to match. As with all products made by Bio-Synergy, Free Motion is produced right here in the UK, so you know you’re getting the finest quality supplements. White Willow (Salix Alba), Ginger Root (Zingiber Officinalis), Calcium Ascorbate, Gelatin (Capsule Shell), Boswellia Serrata Extract, Turmeric Root Extract (Curcumin Longa), Marine Collagen (Fish), Pepper Complex, Magnesium Stearate, Silicon Dioxide. Take three capsules a day with water before meals. "Really great product - I take daily to look after my body properly with volumes of running and back to back exercise. the Vit C boost helps the immune system to. I also take on Ultra events as natrual ingredients to stop swelling etc. Luke Lawrence"